Things are starting to heat up down south with Revolution from San Antonio, Texas! Tour manager Evan Morgan states, "The administration is well on its way to once again providing a great experience for the corps members in 2003. With growth comes the need for more infrastructure to maintain a certain quality of life on the road, and with a Division III title comes the added pressure to meet or exceed your new fans expectations!" The staff from 2002 is once again in place and ready to tackle the challenges head on. Guard caption head Ajay Riojas states, "It is great to have the staff back again for another year, and we added some missing components for the 2003 season to once again challenge ourselves and our membership in Division II competition!" Guard auditions are scheduled for April 25 to April 27; we are anticipating a record turn out for the guard as we had with the brass and percussion auditions back in November and December. 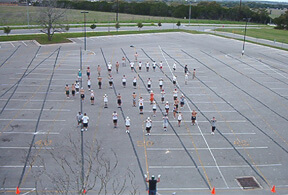 Looking to continue the progress made in the 2002 season, Revolution presents the start of its "Exploration" trilogy that will focus on raising the performance quality of the corps and increasing the entertainment factor for all fans alike. The world is alive with sights and sounds of everyday life, creating both the complex and diverse aspects of our world in which we live. While both separate, they intertwine to help create our visual focus. What the eye sees interprets the sounds we hear, which are colorless and invisible. Exploration I will focus on making the musical sounds we hear more visual thru the use of dramatic movement, play on color and integrated drill maneuvers. It all begins with the fist monotone movement and the introduction of the first theme. As we delve deeper into the piece Connotations the music gets more complex and as more variations on the main theme are introduced, we see the seeds of color begin to take shape. At the close of the show the once monotone program is now seen in vibrant color and the exploration of visual music will be complete. Enjoy the 2003 Revolution at a summer stadium near you!